As I've said before, one of the fun parts of writing this blog is being introduced to new products and people. Recently, I was fortunate to be offered an opportunity to read the new novel, Off the Reservation by Glen Merzer. 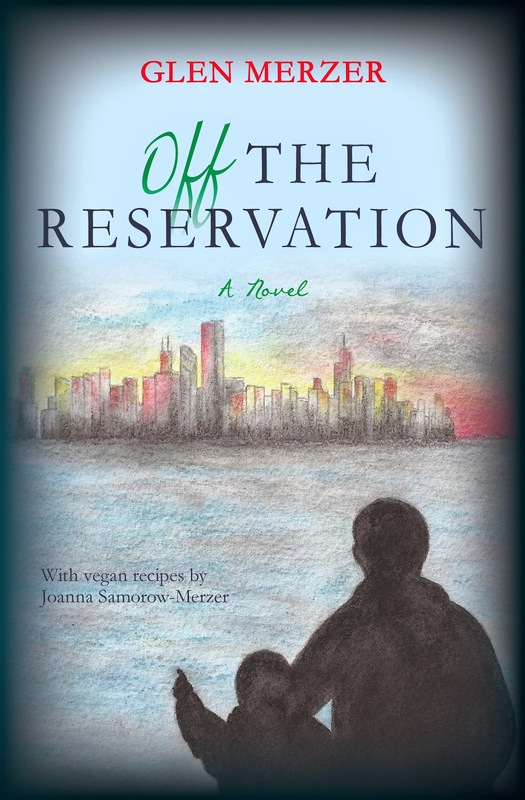 Off the Reservation is the first book from a new publishing house, Vivid Thoughts Press. This novel tells the story of a Congressman, Evan Gorgoni, who decides to run for President. They asked me to review it, because Gorgoni is a vegan, and vegan themes run through the book. There are also 20 recipes in the back of the book that Glen's wife, Joanna Samorow-Merzer created. The recipes reflect meals that the Congressman and/or his family enjoy throughout the book. I really enjoyed this book. I'm a lover of fiction. I like to be swept away by a story, and Off the Reservation really brought me into this crazy presidential campaign. I loved how Congressman Gorgoni tried to run an honest campaign, talking about the challenges facing our country as he sees them without throwing out a lot of fake promises and platitudes. I read this around the holidays, and this book was just what I needed -- a little escape from all the to-do list activities that come around then. The publisher is generously sharing one of the delicious-sounding vegan recipes from the book with us. Sunflower Pate (recipe by Joanna Samorow-Merzer as featured in Off the Reservation). In the food processor, chop the sunflower seeds coarsely. Add the remaining ingredients and process into a smooth consistency. Preheat oven to 350 degrees. Line a loaf pan with parchment paper (to avoid use of oil). Pour in the mixture and bake uncovered for 1 hour or until golden brown. Let cool to thicken before cutting into slices and serving.